Extensive deforestation, habitat fragmentation, and over-grazing put tropical communities at universal risk of destruction. Maintaining regeneration potential in highly fragmented landscapes is critical for conservation. Our work takes place in Los Tuxtlas Biosphere Reserve a region consisting of a matrix of pastures, forest fragments and continuous forest where connectivity between increasingly isolated fragments has been lost. 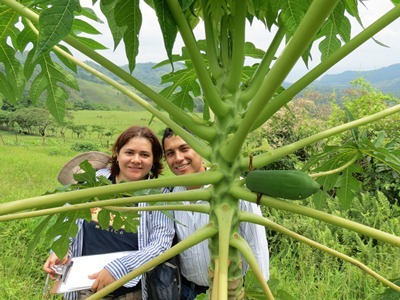 We will test an approach to establishing connectivity among fragments with methods useful for local residents with plantings of economically important tree species (Carica papaya, Ficus aurea and Spondias purpurea). These species rapidly produce fleshy fruits edible for humans and attractive to fruit-eating animals that will carry rainforest seeds into the agricultural mosaic. Planted plots will work as stepping stones connecting fragmented landscapes, assisting conservation of tropical species and maintain integrity of forest communities. These fenced plantings can be used widely throughout the Neotropics to supply valuable non-timber forest products to farmers and local ranchers alike. Plantings can also be arranged to both create family food resources and slow severe erosion that diminishes land value. Results will allow us to recommend viable management strategies that will create connectivity among forest fragments while appealing to local communities by offering food, erosion control, and direct profits.